Rebels in the eastern Democratic Republic of Congo say they have suspended their participation in a peace conference in war torn North Kivu province until extra security measures are taken. A spokesman for delegates representing renegade General Laurent Nkunda claims that one of their delegates was threatened with arrest. Government and rebel delegates have been meeting in the regional capital, but reports from the surrounding area say rebel militias are continuing to recruit fighters and plunder local villages. Selah Hennessy reports for VOA from the regional capital, Goma. A U.N. spokesman in Goma, Vivek Goyal, says he has received several reports in recent days that rebel leader Laurent Nkunda's militia is still recruiting in local villages. A U.N. official who visited Rutshuru, a town north of the regional capital, says on Wednesday she met with hundreds of families who told her they had been forced to flee Nkunda's militiamen. She was told the rebels went to the villages to recruit soldiers, and warned villagers they would be looted if men were not handed over. Now, the official says, the newly displaced are living outside in Rutshuru, without water, food, or shelter during this wet and stormy season. Rebel leader Nkunda's military commander and right-hand man, Bwambale Kakolele, says the reports are false. 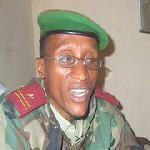 He says his militia is focusing on the peace talks taking place in Goma. Almost 1,000 officials are in Goma to attend the conference. Organizers say they are optimistic the meeting can bring calm to the region. But after the first two days of talks, some people are voicing concern that the conference will achieve little. Jean-Louis Kyaviro is a member of parliament who has come to the conference from the capital, Kinshasa. He says many delegates at the conference do not have the opportunity to voice their views. He says the conference needs to be more democratic. "I think that is a very big problem because people, they have to speak," said Jean-Louis Kyaviro. "It is not, I think, a wise way just to come, to make speeches, then the people clap, and move out. That way can stop people from having the opportunity to explain themselves and they can leave this place as enemies, as they came." Government forces have been battling rebel militias in eastern Congo since August. Last month, the army launched a major offensive against Nkunda's 4,500 - man militia, but was unable to rout out his heavily entrenched insurgency. Kyaviro says bringing peace is not only about finding a solution to the problem of Nkunda. "We have to change the way of governance in this country," he said. "You cannot say that we are going to discuss in this 10 days and you think things will just change in a magic way, it cannot be."